If you’d like a visual inspection of your home’s electrical system because you think there might be problems with it, please call Regal Home Inspections, LLC and we can perform a limited, visual electrical inspection of your system in accordance with the New Jersey Home Inspection laws and ASHI & NACHI Standards of Practice. This is not a “to code” inspection. Our inspection DOES NOT guarantee conformance to local electrical codes. 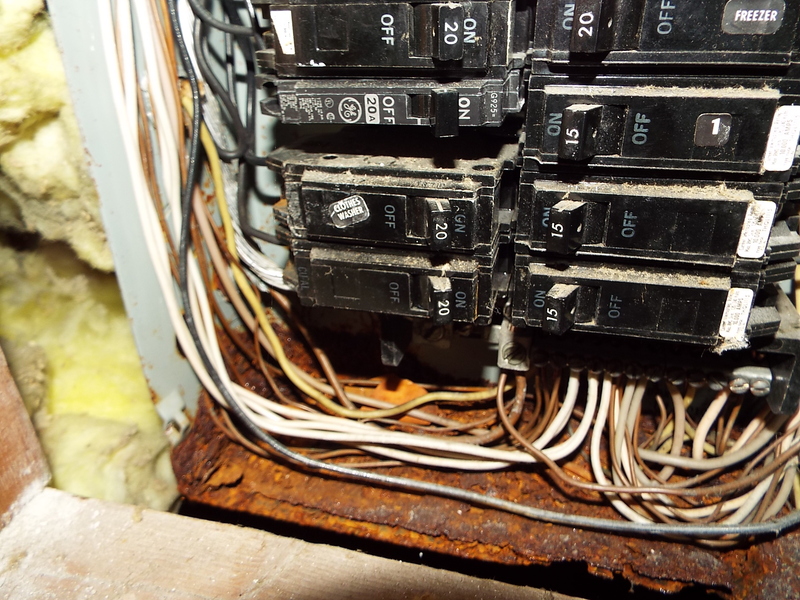 I would predict that 90% or more of the homes that I have inspected have had some sort of electrical system issue. Because of the fact that electricity is very dangerous if not handled by professionals most of the time an electrical issue is determined to be a Material Defect (aka Major Defect). Being classified as a Major Defect in a home inspection report usually means that some corrective action will be taken by the seller prior to closing or that monies have been set aside (escrow) so that the buyer can address the problem after closing occurs. It is very important that if the later of these two situations exist that the buyer use the money for the intended electrical repairs. As defined by NJ State Law, a Material Defect is a condition of the structure or of a System or Component that substantially affects the habitability, value or safety. 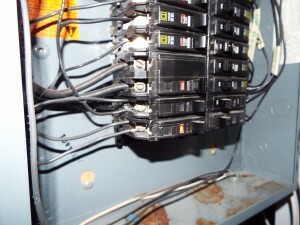 Since electricity can kill, and often does, electrical issues almost always rise to the level of a major SAFETY issue. 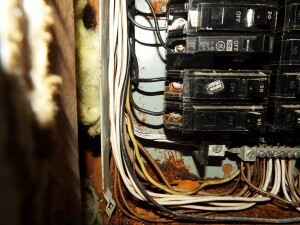 This piece looks at three situations that have recently been found (in the last 2 months prior to the date of this article) that have been highlighted as SAFETY issues and require immediate attention by a licensed electrician. When working with electricity it is very important to have and maintain a secure, tight connection whenever two pieces of the electrical system are connected together. This applies to situations when two wires are spliced (twisted) together or when one wire is connected to a mechanical connection. The mechanical connection may be a screw on the back side of a light switch or outlet or it may be a screw lug on a circuit breaker in the Main Panel or Sub Panel. Why is a good, tight and secure connection necessary? Without getting too far down into the detail, if there is a loose connection and electricity is flowing there is a high potential for a small gap to occur and sparks (or arcing) to occur. If there’s a less-than-ideal gap then the connection between these two metal components may be a high resistance connection. This could lead to the buildup of heat. Both of these two potential situations can lead to fire. A double tap is when someone incorrectly tries to connect two wires to the circuit breaker lug and is of concern because most circuit breakers are designed to hold only 1 wire. When 2 wires are installed into a single lug there is a potential that the wires are of differing gauges (sizes and therefore wire diameters). The larger one may be tight but the smaller will have a poor, possibly high resistance connection and that, as we know, can generate heat or arcing and be a fire hazard. From a circuit breaker function point of view, the breaker should still trip (shut off) if the total current draw reaches the breaker’s trip rating (15amp, 20amp, etc.) due to the total load from the double tap wires. The photo(s) below show what a double tap looks like. The 2, lower left circuit breaker lugs each have 2 wires into them. 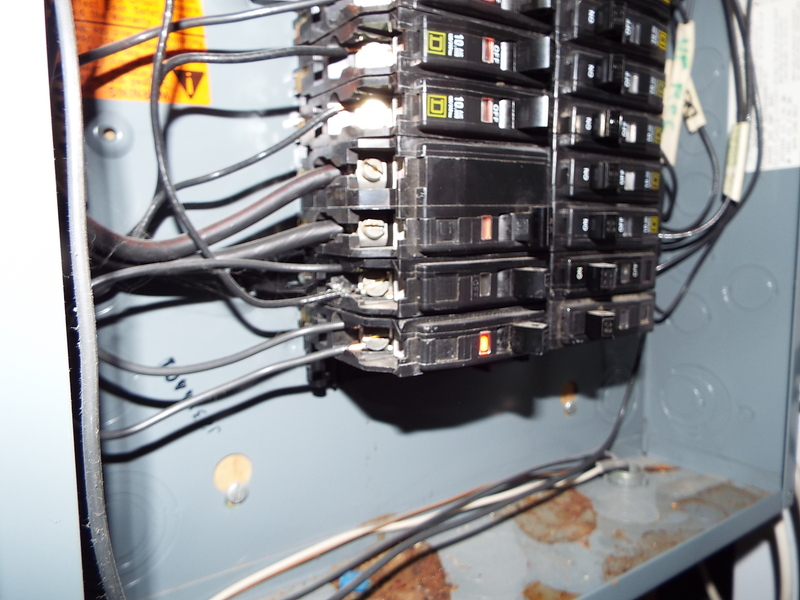 Electrical panels should protect people and property from high voltage energy as found inside an electrical panel. Make no mistake, the energy entering and inside the electrical panel is more than enough to kill someone or start a fire. The panel is designed to isolate the energy fields so the hot or ungrounded wires are not energizing metallic components that should not be energized. When energy is present where it shouldn’t be it is sometimes called, “stray” energy. 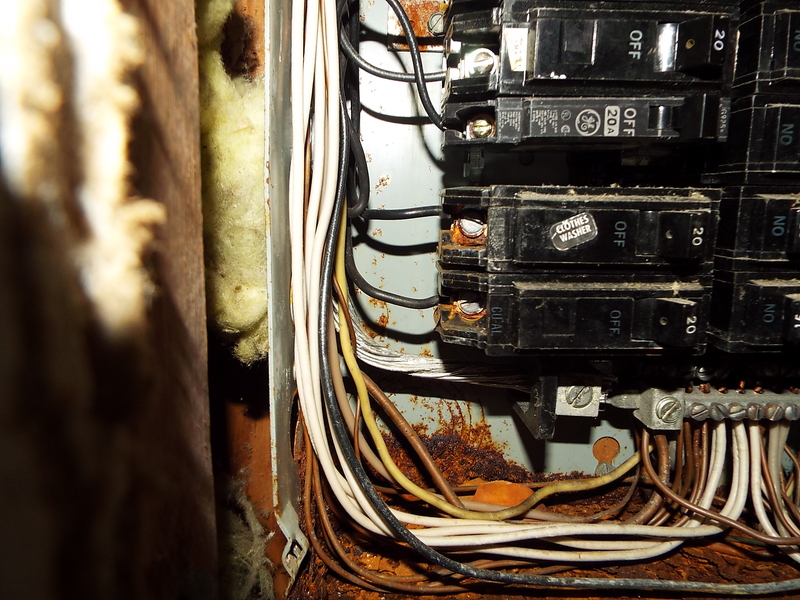 Of course, all hot electrical components should be insulated as not to be a possible source of electrocution and the Electrical (or Service) Panel is no different. They should be clean and free of contaminants or damage. The cover should be properly secured using the correct types of screws. Screws used to connect a panel cover are special in that they do not have sharp points like most screws. The screws for electrical panels have flat tipped screws reducing the possibility that the screw will poke a hole in a wire’s insulation and allow electricity to stray to the panel box. The panel box should be completely sealed. No holes or gaps where someone can poke something in and accidentally get electrocuted. They should be clear of dirt and debris and garbage. These photos are indicative of a very bad panel. Can you tell why? It is not too uncommon to find working (energized) K&T wiring in a very old house today. When electricity was first deployed residentially the technology was Knob and Tube. They did not have cable like we have today. Today, a cable is a tube or jacket of metal or plastic or rubber like material and inside there are multiple wires and each wire is insulated with its own plastic jacket. Sometimes the, Ground wire isn’t insulated but the Hot and the Neutral wires that make up the circuit are. Well in the ”olde tyme” days wiring was different and as mentioned earlier, it’s still here in some old houses. Way back when, the electrician installed individual wires and used ceramic knobs and ceramic tubes to attach and route the wires up the walls and through the floor joists for example. You can see this in the photos below. In fact way, way back when, they used one wire and looped one big circuit. This is like the old Christmas tree light problem. One bulb goes out and the circuit is broken therefore all the lights go out. This too can be seen in the photo below. Note the one wire going into the lit bulb and one wire out. Remove the bulb, or if the bulb pops, and all the lights on that circuit go out! 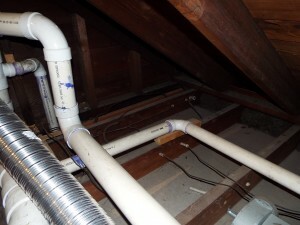 So what’s the home inspection philosophy about K&T wiring? Well, ideally, if you have K&T wiring that is energized you should remove it. It’s like still having gas lamps in the house to provide light. You wouldn’t, right? But technically, the mere presence of K&T wiring is not a Material (aka Major) Defect if (and it’s a HUGE if) the K&T wiring was never modified or touched electrically. Heck, it has lasted this long. It can last longer. However, if it was touched, modified, tapped into, etc. it must be removed. It’s good advice and good, prudent practice. In the photos below look for the white, ceramic knobs and the white ceramic tubes and the wires associated with them. 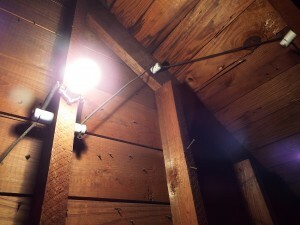 Notice the one wire in and out of the light as well as the ceramic knobs holding the wires off the wood framework. Can you pick out the two wires and the white, ceramic tubes in the wood joist? 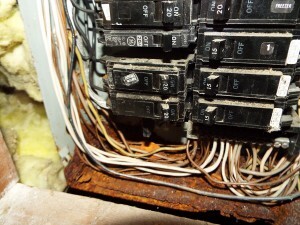 There are way too many electrical issues to mention in one article that I have seen in my inspection career. More articles will come but for now, here are a few of the problems that I have seen and thought you might be interested in learning about.